From time to time we will have some very special Limited Edition collars available and we will feature them on this page. These collar designs are unique in the truest sense of the word. They will use special materials and designs that won't be available on any other collar. These collars will not be customizable so they will be available only in the styles and configurations shown. When the materials used in the construction of these collars run out, we will no longer offer them for sale. Order yours while you have the chance because they won't be around for ever! 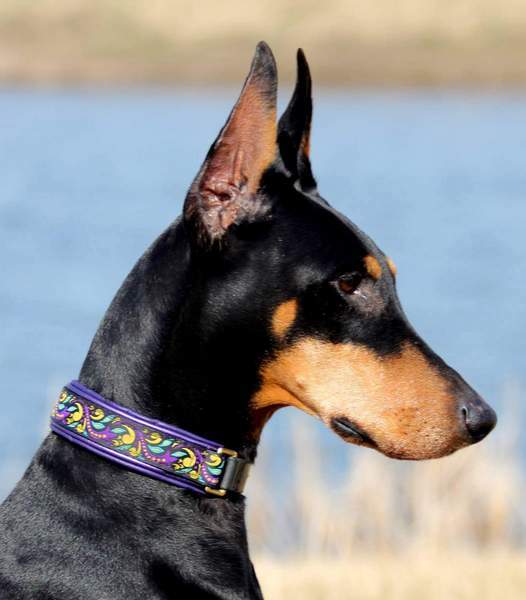 The Purple Reign Collar is our very first limited edition collar. It is made with exclusive leather and ribbon combination that is in tribute to the recording artist, Prince. A series of specially designed collars featuring our popular Leaf Pattern ribbons. These collars are made with limited edition leathers and special designs. Limited Edition collars using our Tiger Ribbons with special leather colors. Limited Edition collars using 1 1/2" wide web and the Hawaiian Mask ribbon. These collars feature limited edition leathers.